It used to be that only swank hotels served Bircher Muesli for breakfast. My other half loves it as a special treat, he loves the tang sharpness of the apple mixed with lemon, the crunch of the nuts and the creaminess created by the soaked oats and yoghurt. Perhaps our mundane domestic breakfast experience is 5* afterall! Soak the oats in the warm water and honey, set aside. Grate the apple then sprinkle with the lemon juice to prevent discolouration. Chop the nuts. When the oats are cold, mix everything together. Serve with an extra dollop of yoghurt and a sprinkle of ground cinnamon. Serves 4. This can be stored in the fridge as a ready made breakfast for a few days. 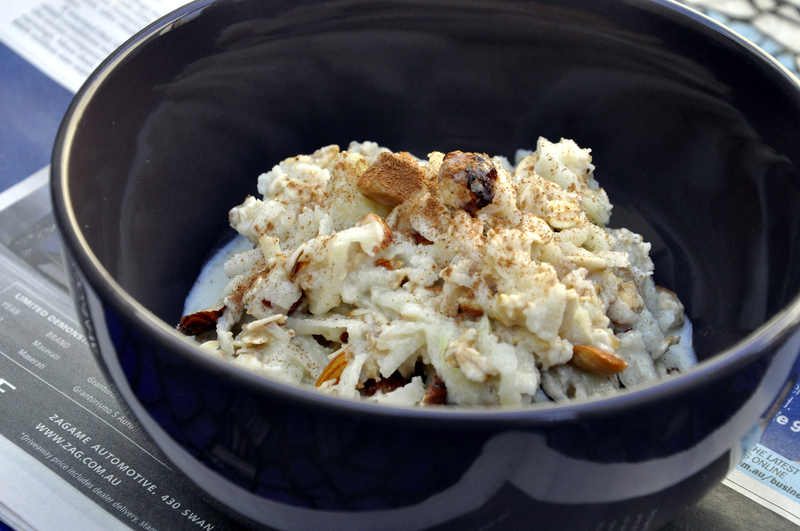 This entry was posted on May 21, 2012 by ladyredspecs in Breakfast and Brunch, Food, Gluten Free and tagged breakfast, healthy, muesli, nutritious.